Please contact us for discounts on bulk orders. pages for your company, organization or cause. "An intriguing look at how invasive micro organisms (self organizing, opportunistic, intelligent systems) force humanity to conspire similarly to meet the challenges they impose upon the macro systems they threaten. 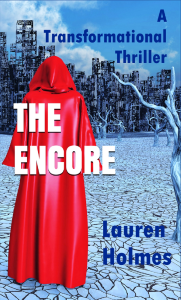 Encore provokes a deep dive into a collective crises for Earth, other planetary systems and all life forms. The story demonstrates how a global crisis forces a cross species investigation leading to greater understanding of our role in the universal flow. We come to realize that our innate human instinct for survival is designed to catalyze creative solutions and collaboration beyond our current perspectives. The initiating experience awakens us to a specific talent that conjures new and addictive flow states with nature’s ultimate wisdom."